A simple description of digital ink-jet printing is that it is designed to take a computer generated or imported image or photograph, and reproduce it accurately in any size. The higher the standard of the original, the better the end print, although software and the configuration of the printer itself can be used to optimise the end result. Although the principles of digital ink-jet print all involve the jetting of inks onto the final material, there are several variations which apply to the overall process. These include the type of machine being used, the different choices in ink formulations and the design and behaviour of the print-heads. All these elements need to be factored into the end machine and the applications it is required to produce. Speed and quality are two of the key criteria sought out by users of wide-format printers but, in many cases, the specifications of printing equipment don’t make it clear that, in general terms, the faster the throughput, the lower the quality. Production rates are also affected by the numbers of passes of print-head across the material to cover it adequately with ink, the length of time it takes to process the job prior to printing, and the resolution or dots per inch being used. With digital printers, you tend to get what you pay for. Inexpensive printers might be adequate for occasional jobs but, where regular and continuous work is being put through the machine, the equipment needs to be sufficiently sturdy to handle heavy use. Ink-jet printing is a non-contact process and, as such, a machine in this category is not a press. 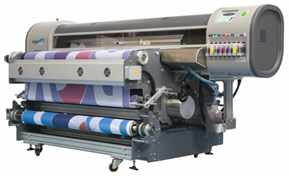 Most wide-format printing machines function with a moving head-carriage in the x-axis and a moving material bed on the y-axis. Material is normally either fed through the printer on a roll or a sheet or held down on a table. Dedicated flat-bed printers hold the substrate firmly to the bed usually with a vacuum although clamps can also be used. The print-heads move across the material, with the number of passes normally determining the eventual print quality. Lack of dwell time at each of the carriage is essential to prevent banding — unwanted striping between passes — and to ensure that the next layer of ink is put down without any evidence of overlap to produce a continuously consistent print. Print drying times depends on the absorbency of the material and the thickness of the ink. Too much ink will also cause cockling caused by over-saturation of the media; too little ink will provide poor colour density. Solvent-based printers rely on heat and air drying to evaporate the solvents and assist the adhesion of the inks to the substrate. 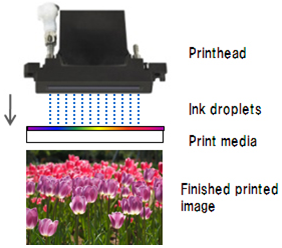 UV-curable inks are dried, or cured, using UV lamps which are applied immediately after each pass of the print-head. Most roll-fed systems have an automatic cutter to sheet the material. Some machines have a roll-to-roll option where the media is re-wound once it has been printed. The advantages of digital printing over traditional methods of output generally lie in its ability to be used cost-effectively for very small volumes and, even, one-offs without there being a cost penalty. It is also popular for applications where variable data and customisation are required — for example, where a basic design and graphic are standard for a given number of prints but personalisation is needed, such as a name or address. The quality of today’s inks and print-heads is so high that it is possible to create prints which contain fine enough dots to be suitable for close viewing. For larger applications, where viewing is from a distance, wide- and superwide-format output can be produced at a lower quality so that it uses coarser dots but which is suitable as fit-for-purpose. Currently there are wide-format digital ink-jet machines which can print onto most materials and provide a gloss, satin or matt finish. There are no hidden costs with these printers and no requirement for additional chemicals in order to produce applications. Most aqueous- and solvent-based inks produce dry results which are ready to use straight from the printer although, with some materials such as those with a high gloss, extra drying time is beneficial. Matt materials and papers are usually dry straight from the machine. Solvent-based printers often incorporate heaters which are used pre- and post-printing to soften the material surface and to speed the evaporation of solvents during drying. With UV-curable inks, the drying process stops as soon as the lamps have been turned off at the end of each pass of the print-heads. Curing can continue over time but output produced using this method is normally dry and ready as soon as it leaves the machine. The disadvantages of wide-format ink-jet printing mainly lie in its inability to handle special colours, such as spot colours, metallics including gold and silver, and other special effect inks which can only be output using the screen printing process. There are machines appearing on the market that will print metallic colours, these are normally up to 2 metres wide. For higher volumes, screen-printing and offset litho will still provide a more cost-effective method of printing longer runs of the same job. Comparative ink costs favour conventional printing processes and not ink-jet. There are machines available now that can print metallic inks but these are specialised and limited in application. Because ink-jets have to produce ink films that are thick enough to provide good colour density but thin enough to pass through the nozzles on the print-heads, one of the prime problems encountered particularly with aqueous and solvent-based machines likes in the ink drying on the nozzles and causing blockages. However, frequent cleaning of the print-heads becomes costly as this process involves the increased consumption of ink. Fewer problems are likely to be encountered when the printer is used on a regular basis. A machine standing idle is more likely to encounter the ink drying on the heads and blocking the nozzles than a printer in daily use where the ink is kept flowing. There is an issue when working with some types of UV curing inks. If a substrate has to be cut, creased or folded through the printed area, it is best to do so as soon after printing as possible. UV ink will continue to cure and it could become brittle. This can result in it splitting during the finishing process. The cost of inks and servicing can be surprisingly high and these must be factored in to any Return on Investment calculations. Print speed is often a controversial area. Print rates quoted on sales literature should be assumed to be at the high end of estimates. The only way to establish true production rates is to carry out trials with your images and time the process from loading the data onto the system through to the finished product off the machine. This is a crucial aspect of machine performance as when you buy the machine your return on investment must be accurate. It is not only the individual machine speed but also how you optimise upstream and downstream activities. When you have the machine demonstrated to you take your own digital files and see how long it takes to RIP the file, load, print and offload to the next operation. Don’t forget your stopwatch. It is very rare that a first time purchaser of a digital printing machine consistently achieves the speeds that are printed on the sales brochure, sometimes they never do. Half the advertised speed is quite normal. Ink-jet printers range in type from home and small office systems, through professional machines for photographers, fine art specialists, proofing and digital bureaux through to those used by sign-makers and screen-printers, to equipment which caters for packaging and superwide-format graphics output. The simplest colour printers are very inexpensive, with many working on the principle where the machine cost is low but the consumables prices are high. Larger aqueous-based printers are used typically by bureaux and other display producers who want the ease of use on offer with these machines but are prepared to over-laminate to protect their prints. Mid-range companies, such as sign manufacturers, screen-printers and display producers who want to produce their own durable output are more likely to invest in either one of the solvent-based families of machines including heat curing water based elastomers or in a UV-curable system. The latter type of printer will allow them to print direct to rigid and flexible materials, whereas the former kind of printer will be suitable for production onto coated and uncoated materials. The high-end companies are those which will probably own and use printers which fit into the other sectors but will have also invested in industrial flat-bed and roll-fed systems which can be used for continuous, often unattended, output. These businesses will normally invest in high-speed machines of at least 3.2 in width for flat-bed UV-curable production and between 3 m and 5 m for roll-fed applications. There is an increasing move towards UV-curable printers as they do not carry the same emissions as their solvent-based counterparts. 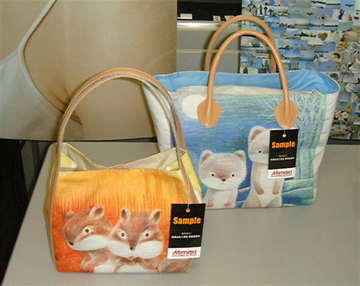 There are three primary ink types using with digital wide-format printing for the graphics market although textile production can now also be carried out using the ink-jet process. Aqueous-based inks comprise a combination of water, glycol plus pigments or dyes. The inks in this family are designed to run specifically in printers with thermal and piezo-electric print-heads. Because the main constituent in these products is water their performance varies on different materials, with special coatings on the media providing better behaviour and durability. However, aqueous-based prints need additional protection to give them durability even though their archival properties can be around 100 years. Solvent-based inks are relatively inexpensive and have the advantage of being able to produce good vivid colours onto coated and uncoated roll-fed materials. However, their main ingredients are volatile organic compounds (VOCs) which produce harmful emissions. These inks need to be employed in machines which have ducting to extract the solvents to atmosphere. It is possible to remove the VOC’s using activated carbon filters without ducting to outside the building however you still have to dispose of the solvent laden graphite. Prints produced using solvent-based inks have a strong odour. The higher the level of the solvent, the greater the keying, or bonding, with the material’s surface to give a durable finish. Types of solvent range from eco-solvent, low and mild solvent through to hard or full solvent. The term eco-solvent does not necessarily mean less environmentally damaging than conventional solvent. It is more aligned to cheap rather than environmentally friendly. UV-curable inks comprise monomers, oligomers and a photo-initiator which reacts when exposed to UV-light. Free radical UV-curable inks cure instantly when a direct beam from a UV-curing lamp is applied. Cationic UV-curable inks start to cure when presented to a UV-curing lamp but have a daisy-chain effect which means that the process continues until all areas of the ink have been reached, regardless of whether or not the lamp is on or off. Although UV-curable inks can be used on both roll-fed and rigid substrates, they do not key with the surface but sit on top of it. It is necessary to ensure that the surface energy of the substrate is high enough to form a sufficient bond with the ink. “Latex inks” are a proprietary brand from HP and these offer the same characteristics and durability as mild solvent-based inks but the ease of operation found in aqueous-based inks and there are no emissions, VOC’s or odours. Although HP is calling this ink latex, the formulation is 100 percent synthetic and totally non-allergenic. They are suitable for use on most of the materials which currently can be printed via solvent-based systems, both coated and uncoated. As with all ink systems due notice has to be taken of the total cost of use that includes coverage per litre and energy usage as this will significantly affect cost of ownership of the digital printing machine. The most commonly used ink, or dye, in the textile sector is called dye sublimation. This is a process which is also used extensively in the small gift market. Disperse dyes are used for polyester materials, whilst acid dyes are suitable for fabrics such as wool and nylon, and reactive dyes are best for textiles such as cotton and rayon. Combination textile printers are able to handle more than one type of dye, so that a single unit can be used for reactive, disperse and acid inks. Machines using piezo-electric printers and generally more flexible as they can run all types dyes. The print-heads tend to have a longer head life and a higher resolution with less dither. Because of their method of drop formation which uses heat, thermal print-heads cannot handle textile pigment dyes with built-in binder systems. The heat levels react with the internal binder and can cause print-head failure. The versatility of ink-jet printing has led to its popularity for any individual or business wanting to produce colour (or black and white) output quickly and easily, via a computer and special software. 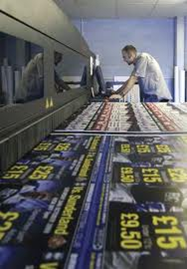 In the graphic arts market, wide-format ink-jet production has enabled companies to produce short-run colour applications which would normally not be practical or cost-effective when printed using more traditional analogue methods, such as offset litho or screen printing. Ink-jet printing is now commonly used by anyone with a modest knowledge of computers and colour production. Examples of output include photography and fine art applications, signs, posters, displays, point-of-sale and indoor and advertising, vehicle liveries and event and exhibition graphics. The use of the process is now extending to niche markets which can include wall coverings, backdrops for theatre, film and television, building and scaffold wraps, special finishes for wood and metal. Ink-jet can even be used to print food decoration and is also finding uses in electronic industries for fine printing of circuit boards. Today’s solvent-based printers and materials usually have an outdoor durability of two to three years, and this can be extended by adding a laminate to protect the finished print. Many UV-curable applications cannot be overlaminated because the adhesion and surface of the inks preclude it but, even without additional protection, this output generally has an exterior life of at least two years. Inkjet printing is growing in areas other than straightforward graphics printing. The enabling aspect of this is the development of print head technologies. Until recently the heads have been designed for a very limited range of systems, these being nearly all lacquers, finely ground pigment or dye based inks. 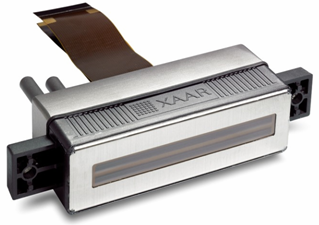 Companies such as XAAR have changed all this with techniques such as their “Side shooter” technology. This system circulates the medium through the head, keeps the head clear and the medium at a controlled temperature. The effect of this and other characteristics mean that it is possible to jet a much wider range of materials for applications such as in the printed electronics field, building micron sized structures and other emerging technologies. There is no doubt that digital printing techniques will be a vital part of manufacturing in the future. A still not fully explored area is MEMS (Microelectomechanical Systems.) FujiFilm Dimatix has produced along with others a silicone based head that uses semiconductor fabrication techniques to create a drop on demand printhead with a fluidic pumping system in a single component. This enables high speed printing over large areas. This technique should increase dramatically the performance of graphical printing systems. MEMS are also being used in laying down a range of different materials further increasing the move of digital printing into manufacturing.